Sourdough. Lots of it. fresh with salted butter and homemade blackberry jam. Toasted with serrano ham and aged comté. After a week of non-chewy food, I was ready for bread. Proper, crusty, chewy bread. 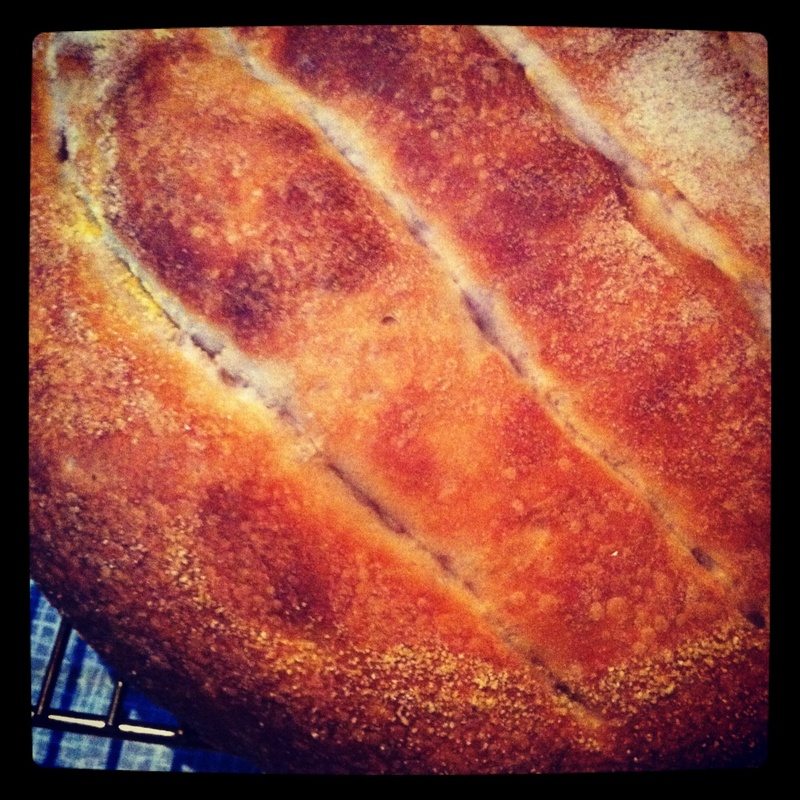 Sourdough, in other words. After all, there is only so much polenta, mash, porridge, riz au lait and yogurt one can eat before entering a state of depression. I pretty much bake a sourdough loaf a week. Sometimes I use a spelt starter, at others a rye-based one. I also vary the flours used in the main dough. strong, organic white mixed with spelt (usually), or once in a while rye, or just plain white. I know you are supposed to be exact when you bake, but I am not at all. Probably the reason why I will never be a great pastry chef. But then, again, I am not much for cake anyway. That is, unless it is really exceptional, or an apple galette. This recipe makes one (very) large loaf. It will keep for about a week if you use organic ingredients. It can be done in a day (morning to eve kind of thing), but it tastes much better if you do it properly. And you have to leave one hour between the folds. That cannot be skimped on. Sorry. Day one: Mix 1 dl water and starter in a very large bowl. Add 100 g flour. Stir and leave overnight on the kitchen table or somewhere else that is not too warm, not too cold, and also not drafty. Day two: Add 1 dl of water and a further 100 g of flour. Stir and leave overnight again. Day three: Add the final 4 dl of water, the rest of the flour, and then the salt. Give it a good stir. Knead in a ‘robot‘ for 10 minutes (no longer for spelt, please), or for 20 minutes by hand. If the dough is too sticky, add more flour after a few minutes of kneading. The dough should be wet and springy, but not impossible to handle. 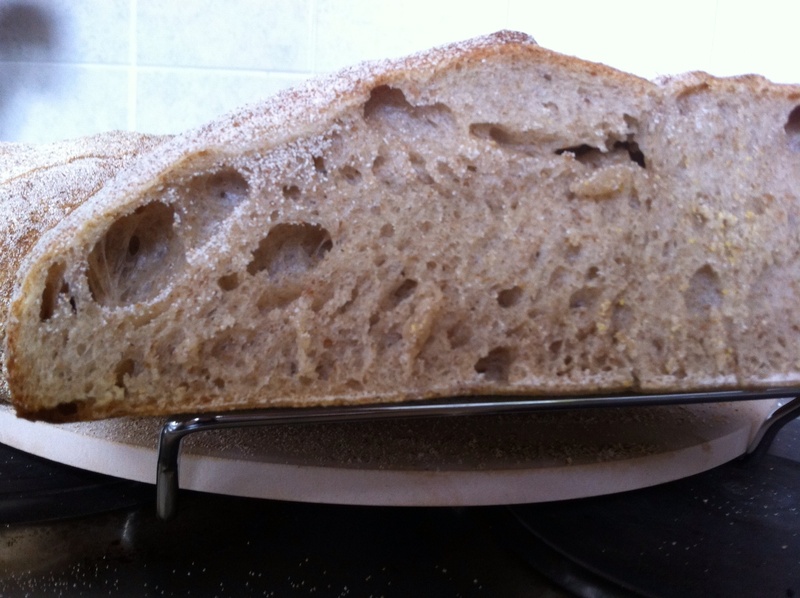 If it is too dry, the bread will be dense. Leave to rise for 2 hours or so. Take the dough out of the bowl and slam it on the table (literally). Pull and stretch the dough as much as you can without tearing it. Then fold the top third of the dough towards the middle, and afterwards the bottom third over the top. Turn the dough 90 degrees and repeat. Turn a final time and repeat again. Return to the bowl and leave for another hour before repeating this process once more. Then repeat again (a final/3rd time) after a further hour’s rest. This time, transfer the dough to a large proving basket dusted with semolina, sprinkle the bottom of the loaf with polenta (corn meal), and cover with clingfilm. Leave the dough in peace overnight somewhere quite cool. Day four: In the morning, turn on the oven to the maximum temperature, leaving the baking tray on the second-to-bottom shelf, and a loaf tin full of water on the shelf below. Mine gets to 240 C (fan). Go have a shower, grind some beans, and have a good coffee. Your oven should now be ready. Take out the very hot baking tray, and turn the dough out straight onto the tray. If you please, score deeply (almost to the base) with a very sharp knife. Transfer to the oven and bake for 8-10 minutes, keeping a watchful eye, then turn the temperature down to 190 C (fan) for a further 20-25 minutes. The bread is baked when it sounds hollow when tapped on the bottom. It is a rare day, we do not enjoy sourdough. Yum, the crust on that bread is amazing!